Thank you for taking a look at the iOS app Wicked Dog and the Messages app Wicked Dog Stickers that is included with it. The apps are a fun way to personalize your free time, and it doesn’t get much more personal than playing with your own beloved family pet. This guide will identify the key parts of the app and point out special features that are certain to be of interest to users. Please contact us at pr@wicked.app if you have any questions. There’s nothing unusual about dogs drawn as artwork and included in an app or on a sticker. Letting the user create their own dog – to match their family’s pet, for example – is completely different. In Wicked Dog, there’s no pre-drawn dog artwork, so there are no preconceptions of what the user’s dog might look like. This gives the user to create an image that’s near and dear to them, and the app the opportunity to use the dogs in novel ways. Wicked Dog lets the user customize at least one hundred characteristics, from the overhang of the jowls to the curve of the abs to the resting angle of the hind legs. The fur options range from straight to curly, short to long, thin to thick. There’s banding and brindle patterns. And spots! Oh my, spots of different shapes, sizes, and colors. Look in the kennel at the dog named Betty for an example of spots, and Mila for banding and brindle. Sophie shows some of the variety of fur that’s possible. This is the key to making the app wicked. It’s by knowing and understanding the anatomy of the dogs that Wicked Dog can animate the user’s dog. In this way, the app can set the angle of the front paws when the dog jumps, the lean of the neck and head when it runs, and the floppiness of the ears when it bounces. Wicked Dog calculates all this on the fly for each dog without slowing the game action. A more subtle effect of anatomical intelligence is how it changes game play. Based on anatomy, some dogs will run faster and some will jump higher. And every dog will improve with regular practice and degrade with laziness. You know your dog, and you know the toys it prefers. That’s why Wicked Dog lets users select their own favorite toys from all the available emoji. Besides being more fun for the user, it changes the game play. A flying disc will bounce differently than a pumpkin or a tennis ball. That bounce can even affect the way the dog interacts with obstacles on the Agility course, so choices have wicked consequences. Agility, in particular, is a game of skill. It’s easy to play, but difficult to consistently excel at. Swiping at precise angles while running full speed and anticipating obstacles takes practice (or skill or talent) to master. But it is fun at every level of skill, and even more fun when you share the challenge with friends. Use Messages to issue a challenge to a friend or group of friends, and see if their dog(s) can beat your dog’s time on the course you designed. Use Game Center for live multiplayer matches against friends or other players around the world. Your three-race total time is added to leaderboards, and there are achievements to reach for running courses without penalty. There are many ways to share a dog. Users can share to social media. They can create a GIF. They can copy the dog’s DNA and text or email that to a friend (so the dog’s shape, size, fur, spots, etc don’t have to be recreated). They can create and peel & stick stickers in Messages. Wicked Dog creates a Siri Shortcut every time you play a game, and can show that to you on the lock screen. Wicked Dog can also be opened by a Siri request from you. Just ask, “Using Wicked Dog, show me a photo of [dog’s name] [doing something].” Show a photo of “Chena barking,” “Zia dancing,” or “Betty begging.” The list of actions includes wagging, shaking, barking, begging, sitting, dancing, yoga, jumping, resting, barfing, angry, yawning, and more. Wicked Dog Stickers is a Messages app included with Wicked Dog. It allows the user to create and share billions and billions of unique custom stickers. The user sets the text, shape, color, animation, and much, much more in essentially unlimited combinations, and Wicked Dog Stickers creates the stickers in real time for them to peel and stick onto any message. We appreciate your interest in Wicked Dog Stickers & Wicked Custom Stickers, a breakthrough in allowing users to build their own stickers – with selfies, text, shapes, and animations – rather than be limited to clip art. This guide will identify the key parts of the app and point out special features that are certain to be of interest to users. Please contact us at pr@wicked.app if you have any questions. 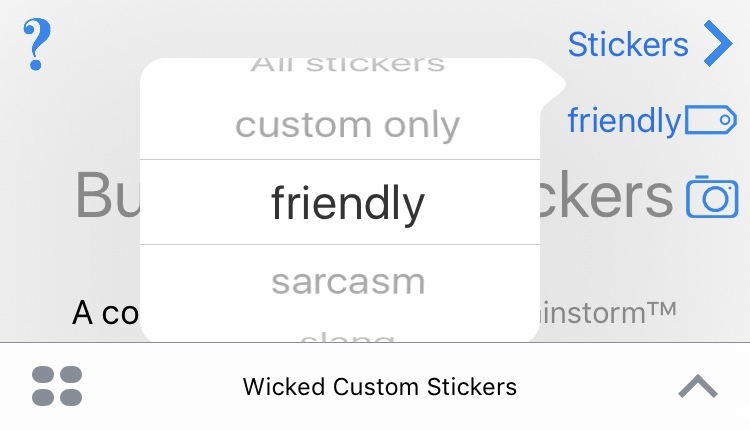 Wicked Custom Stickers is an iMessage app. It works within Apple's Messages app and is available through the iMessage App Store. Wicked Custom Stickers and Wicked Dog Stickers are the same app; Wicked Dog Stickers is included with the Wicked Dog app. The goal of providing custom stickers is to turn a conversation that looks exactly like any other into one that expresses your unique personality and the unique relationship you have with your family, friends, and coworkers. 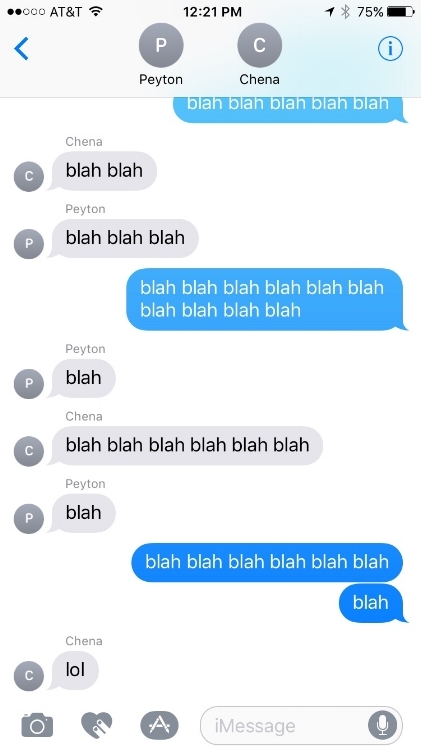 Our custom stickers allow you to respond to and comment on any message in the conversation, and not just add your text to the end of the list. They provide yet one more beautiful way to communicate with the people you are already messaging. Wicked Custom Stickers includes unlimited custom stickers and dozens of already-written stickers, just to get the user started. Even for those that are pre-built, the user can still customize them by selecting any font or changing the stickers' color, size, animation, transparency, and shape. Tap the Stickers button to see the stickers. 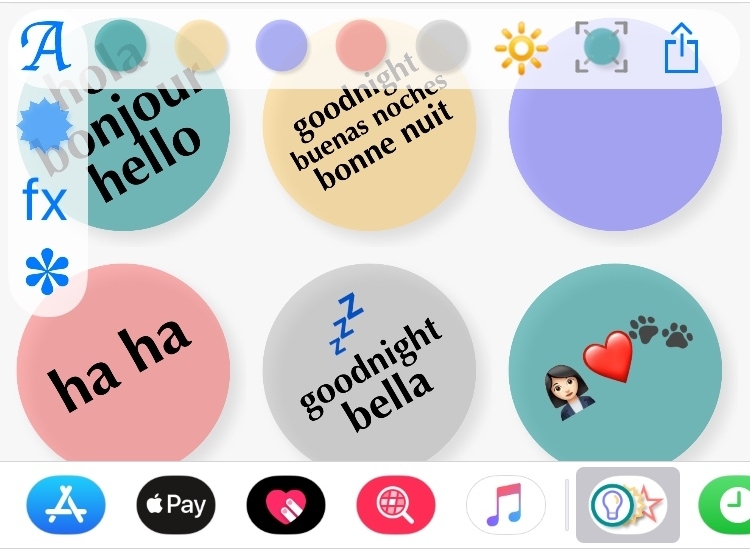 Either press and drag a sticker to any message ("peel and stick" in Apple parlance) or tap the sticker to add it as a new message. Pre-built stickers are fine, but they are still just someone else's words. To customize your stickers, you'll want to use your favorite phrases and personalize the stickers for the people with whom you're texting. Customizing the text allows you to have stickers you'll want to send to family and friends, and stickers that are professional enough to use at work. Tap the Build custom stickers button. Type a phrase from one to three lines. You'll see how your words align on the sticker. Tap the Add now button, and then tap the down arrow to return to the navigation screen. From there, view your stickers, including the one you just added, and use it as described prior. Wicked Custom Stickers provides for more than just plain text on stickers. Text animations allow you to give that text emphasis to make it noticeable to the people to whom you send it. Special effects animations add extra emphasis to make the sticker extra noticeable. And logos and emoji badges let you show your personality and passions. Changing the stickers' appearance is a simple tap. Experiment with selecting a different font. Tap on the color swatches. Change the stickers' brightness. Changing the stickers' shape is the easiest way to create a unique look. Tap the shape button, select a shape from the list, and the stickers are automatically rebuilt for you. Tag stickers to control which ones display. 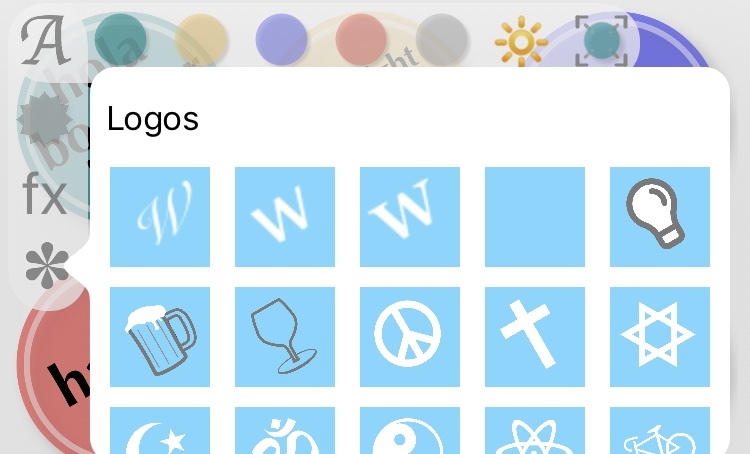 Showing just the ones with the "slang" tag or a "work" tag allows you to display and find stickers faster. 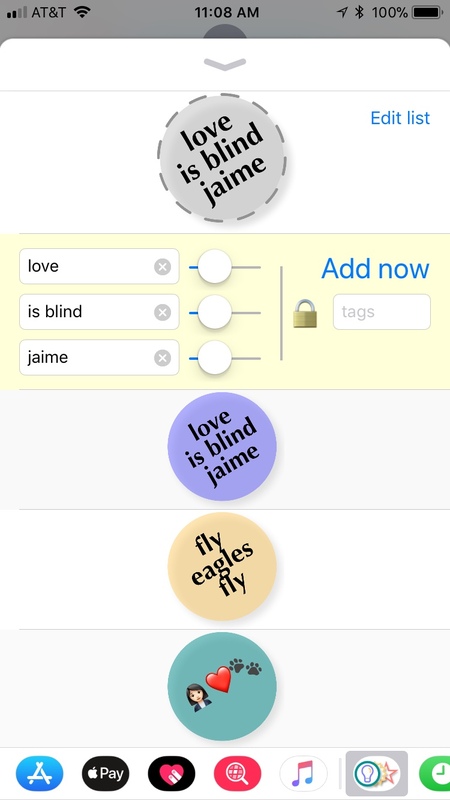 To use tags, select from the list of tags and then tap the Stickers button to display just those that match the selected tag. Nothing is more personal than your face, so add that as a sticker with our exclusive Selfie Stickers! The photos you take and use will be automatically presented as the background to each of the stickers. Photos are automatically cropped to the shape you select, and your text is overlaid on the photo in the selected color, font, and animation. Just tap the camera button, take a photo, and go look at all the stickers rebuilt automatically for you with your photo, text, shape, and all the rest.